Scaphopods – popularly known as tusk shells - form a distinctive class of marine molluscs characterised among other things by their curved, open-ended shells. The head and foot of the animal can protrude from the wider aperture of the shell, whereas the digestive, respiratory and reproductive organs are always contained within the shell. The entire animal can retract into the shell if disturbed. All scaphopods live buried in sand or mud. The foot digs to help find food (such as tiny invertebrates) and tiny tentacles secure these food items for the radular-teeth of the mouth. At rest, oxygen-containing water is drawn into the narrow end of the shell for the gills. Although some species may reach 140mm in shell length, most species are less than 20mm long and many of these are as tiny as a rice grain. Tusk shells are not often seen living, and several inhabit water as deep as 2000 metres. Australia has approximately 106 species of scaphopod known to date or about 20% of the world total (500-600 species). 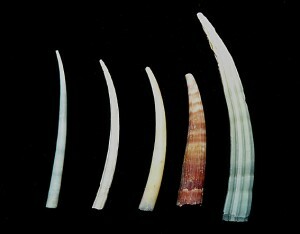 A Selection of Australian Tusk Shells. (Left to right: Dentalium grahami, D. javanum, Calliodentalium crocinum, D. formosum, D. elephantinum).